The global physician dispensed cosmeceuticals market is somewhat consolidated in which the top three companies, namely Allergan plc, L'Oreal S.A., and Valeant Pharmaceuticals Inc. held over 56.0% share in the market in 2015. Among the three, L'Oreal S.A. held the dominant share of 28.0% in the same year. The market for physician dispensed cosmeceuticlas, at present, is seeing a paradigm shift because of numerous skincare specialists, dermatologists, and trichologists starting their own companies. However, the leading names in the industry are from the skincare and cosmetic industry. 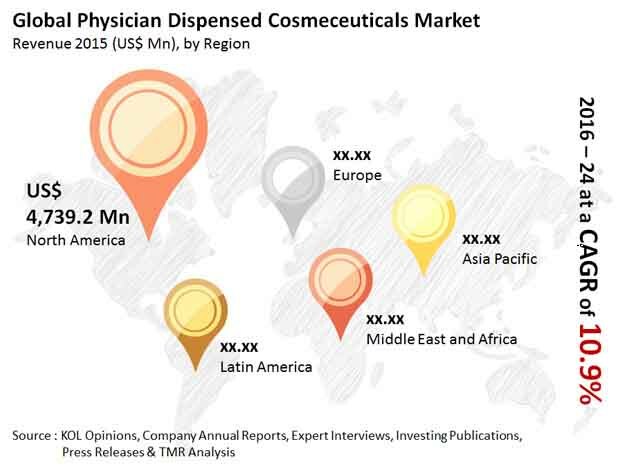 A wide array of products are available in market for physician dispensed cosmeceuticals. In order to stay on top consumers’ preferences, manufacturers need to keep in mind consumers likes and dislikes. This has led to massive thrust on product differentiation among companies wanting to expand their market shares. Not just well-entrenched big players but also small local players are seen upping the ante against their rivals with a focus on advanced cosmeceuticals having different benefits. A research study by Transparency Market Research (TMR) forecasts the global market for physician dispensed cosmeceuticals to expand at a 10.6% CAGR from 2016 to 2024. Rising at this rate, the report expects the market to attain a value of US$27.6 bn by 2024-end from US$11.2 bn in 2015. The different types of products available in the global market for physician dispensed cosmeceuticals are skincare products, eye care products, hair care products, and injectable botox, among others. Among them, the skincare products segment accounts for a mammoth share in the market because of the growing demand for effective cosmeceuticals to cure dermatological conditions. The rising consciousness among the elderly and the middle-aged people is also serving to generate demand for this product segment, especially for anti-aging products. From a geographical perspective, North America grosses the most in the global market for physician dispensed cosmeceuticals. Going forward, however, Asia Pacific will beat North America in terms of growth rate by clocking a robust 12.3% CAGR from 2016 to 2024. This is mainly because of high demand for skin whitening, acne treatment, and hyperpigmentation products owing to the tropical climate and a sizeable proportion of teenagers. A noticeable trend these days is dermatologists producing their cosmeceuticals along with running their skincare centers. This is lending momentum to the market and will continue doing so in the years to come as well. On the flipside, apprehensions of consumers regarding the potential side effects pertaining to the use of cosmeceuticals can pose a roadblock to the global market for physician dispensed cosmeceuticals. Apart from that, dearth of knowledge among customers about cosmeceuticals, namely Botox and derma fillers is also likely to crimp growth in the market, particularly in developing and under-developed countries. Economic downturns can also have a negative impact on sales. Helping to overcome such challenges is the growing demand for branded cosmeceuticals because of their safety and efficacy and the increasing awareness about new skin conditions resulting from changes in climate and pollution.